You will obtain three kind of iron ore particles after screening, respectively of 75~12mm, 12~2mm, 2~0mm in size. 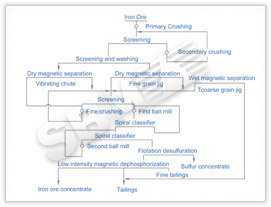 The largest ore particles pass to dry magnetic separation with shaking chute, the middle ones are moved to dry magnetic separator with coarse jigging, and the smallest to wet magnetic separator with fine jigging. The middlings produced by three processes are moved to screening process. The tailings of wet magnetic separation will be discharged directly. Tow stage spiral classification of close-circuit is conducted, with second ball mill grinding after the second classification.